Diver above the boilers of the carmarthen. An old favourite this. The Carmarthen was an armed steamer of 4262 tonnes which was torpedoed off the Lizard. She managed to make it just north of Kennack sands before she sank in 20m. Reference. 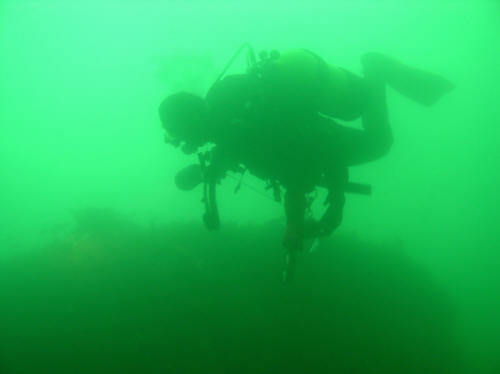 Today all but the boilers are flattened, but she makes an interesting dive with plenty of nooks and crannies to explore and an abundance of marine life in the summer months. My thanks to Mike at Porthkerris for the trip down to the Lizard.